Synthetic peptide corresponding to Human MDMX/MDM4 aa 93-106. 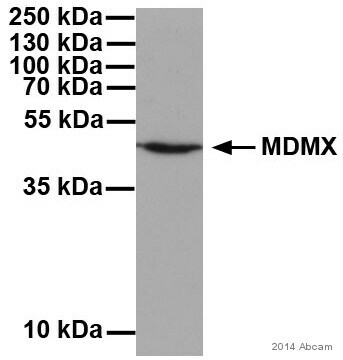 Recombinant Human MDMX/MDM4 protein (ab114467) can be used as a positive control in WB. Our Abpromise guarantee covers the use of ab49993 in the following tested applications. WB Use a concentration of 1 - 2 µg/ml. Predicted molecular weight: 55 kDa. Expressed in all tissues tested with high levels in thymus. Region I is sufficient for binding TP53 and inhibiting its G1 arrest and apoptosis functions. It also binds TP73. Region II contains most of a central acidic region and a putative C4-type zinc finger. The RING finger domain which coordinates two molecules of zinc mediates the heterooligomerization with MDM2. Ubiquitinated. Deubiquitinated by USP2; leading to stabilize it. Publishing research using ab49993? Please let us know so that we can cite the reference in this datasheet. It is written that the band should be around 55kDa on the ab49993 data sheet, but the band on the western blotting of the ab16058 is around 80kDa. Why the actual band size is different from the predicted size? Thank you for your inquiry. The actual size was smaller than the predicted one, the reason can be thought that the post translational modification, e.g. phosphorylation, glycosylation etc. They increase the size of the protein. 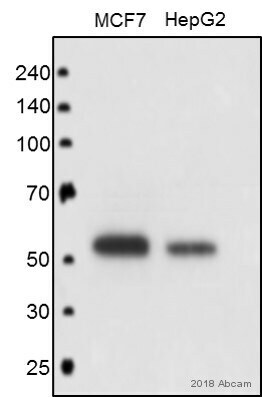 The 80 kDa band of ab16058 datasheet was no longer detected after the addition of competing peptide, suggesting that this band corresponds to MDMX.